27-Nov-2015 -- This is the first out of 3 reports reaching confluence points during a bicycle trip through Central Greece. Thursday afternoon after work I took a flight from Zurich (Switzerland) to Athens. My bicycle went together with me – meanwhile I know exactly how to pack the bike for a plane ride. Arriving in Athens very late at 0:40 AM, I unpacked my bicycle from the box and rode out of the airport. I rode to the nearby coastal town Artémida (ca. 8 km) and stayed in the Hotel Medusa. The next morning I rode my bicycle to the confluence point, which was just 5 km from my hotel. Nevertheless, I got into a thunderstorm where the horizontal rain made me soaking wet. 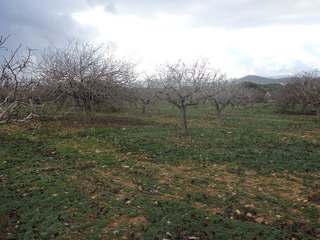 The confluence is located in a pistachio orchard within easy reach from the dense network of roads and tracks around it (about 50 m from a track and 200 m from an asphalted road). I was able to bring my bicycle directly to the spot. The coast at 2 km distance can be seen from the confluence point. Right after the visit, I rode into Athens. From Mount Lycabettus I got a great view of the city. The story continues at 38°N 23°E.